These are the words that accompanied many of my dinners when growing up. Well it seems I still haven’t grown up as this is all about how to do just that! Beneath are 5 methods for exploring ways of getting inventive with food. They were born out of a session I did with a group of professional recipe developers at the Swiss company Thermomix, but they principles apply to everyone wanting to get their Heston on and explore more interesting and adventurous ways of cooking. Even if you haven’t got a culinary bone in your body, these are also creative techniques that can apply everywhere i.e. they’ll help you cook up all sorts of ideas outside of the kitchen too. If variety is the spice of life, it’s the essential ingredient in perking up your recipes. You’ve heard the expression, ‘you are what you eat’?. In this case it’s a matter of ‘you are what you repeat’. The same environment inspires the same thinking. Eating in the same places and cooking the same sort of meals is merely conditioning yourself to enjoy the comfort of what you know best. If you want to be more creative, get out and explore new eateries, surprise people by ordering the dish they wouldn’t expect you to eat and challenge yourself with recipes you wouldn’t typically try. After all, adventure begins at the end of your comfort eating zone. Adventure isn’t just food related either. 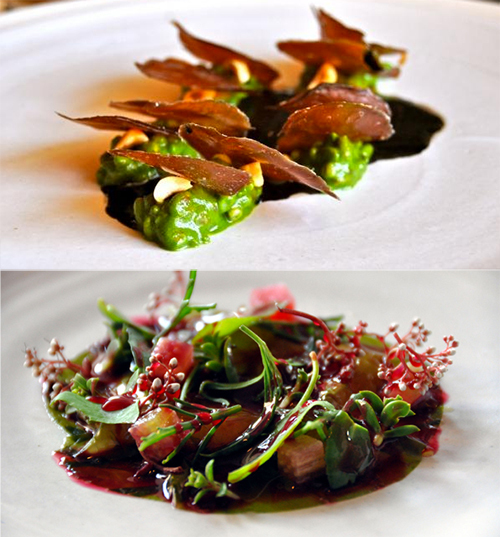 At Noma (often regarded as the world’s best restaurant), head chef Rene Redzepi gets his inspiration from the natural environments around Copenhagen to compile dishes that look like they’ve come straight out of a forest fantasy. Novel experiences provide inspiration to attach new meaning to food. It might be the imagery, colours, words, feelings, sounds and so that provides the spark for your imagination. You’ve then just got to ask yourself the question, “what story does the dish tell?”. Let’s play a game to see how this can work in action. The game is called ‘Movie Munchies’. Pick a letter of the alphabet at random. You can just close your eyes, wave your finger around and point at your keyboard to find one. Think of a main ingredient that starts with that letter. Pick a movie. You might look in the tv guide for what’s on, pick one out from a popular IMBD list, or just one that springs to mind. Now use your movie as inspiration to create a dish using your main ingredient. How might the associations, themes, actors or environments inspire you to invent a way of cooking or presenting your chosen ingredient. I had a go and this is what I came up with. I chose the letter G at random. Hmmm, gherkins, gammon, game, goose. I’ll go with goose. I picked the movie Inception. There’s a strong theme of dreams in this movie. So how about a dish that helps lull you to sleep? I can use ingredients known for inducing sleep. The goose could even be served on a bed of them! A little research later led me to find out that sweet potatoes, pistachios and prunes can help induce sleep. So there’s my bed, a bake of these three ingredients. I also know chamomile is famous as a relaxing tea. So I’ll rub my goose with dried chamomile and salt rub before roasting. That’s just one idea, (that actually sounds alright!) but the potential inspiration is endless! 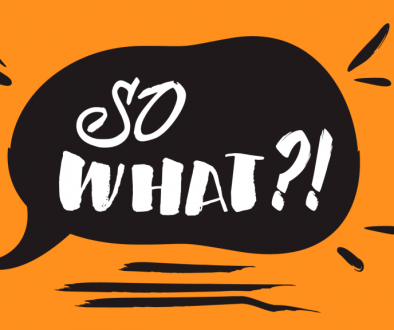 By doing something the ‘wrong way’ on purpose, you are going to think in unexplored territory that few have dared to go. This is where unusual and surprising ideas are formed. The trouble is, our brains are generally programmed to ensure we stick to what we know to be right and be on the safe side. To make it easier, we bunch foods and ingredients into categories. Once they get a label, it can seem ridiculous to use them in other ways. Our taste buds are complex and there isn’t always a right and wrong way of titillating them. But if you never try, you will never know. Bacon has been appearing more and more in what would usually be sweet foods. 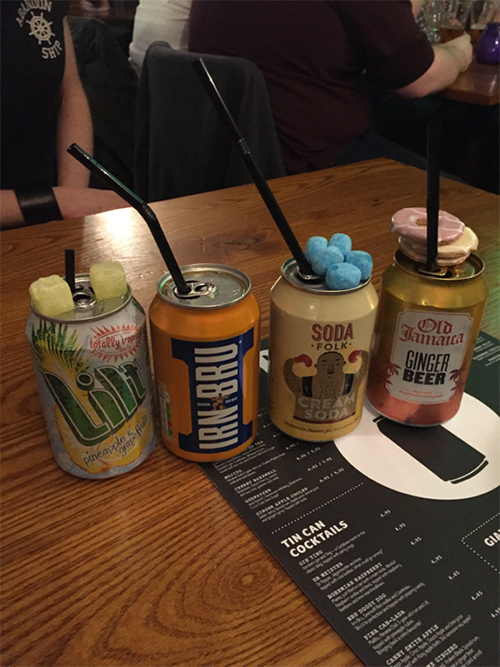 On a recent trip to Aberdeen, Scotland, I went to two restaurants. 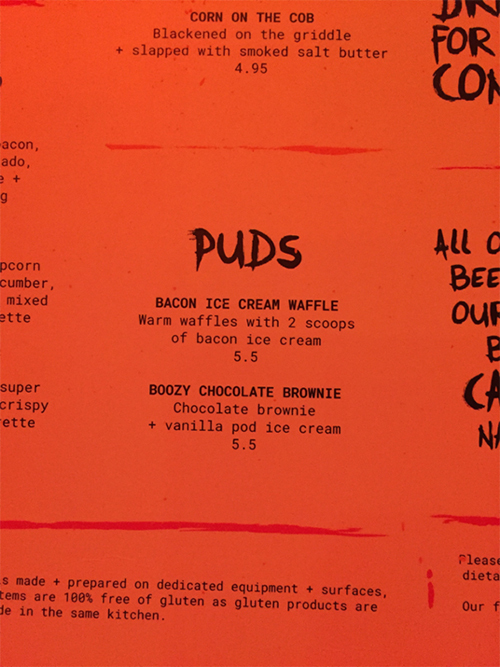 In one I chose to try the bacon ice cream waffles and in another, I was asked whether I’d like to upgrade my milkshake with bacon bits (I of course said yes). 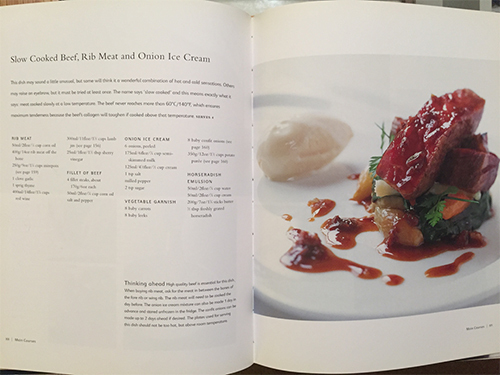 Even stranger seeming, on my cookery bookshelf I have ‘Formulas for Flavour’ by John Campbell which contains a recipe for beef rib with onion ice cream! It’s not just sweet and savoury mix ups that are breaking the rules. 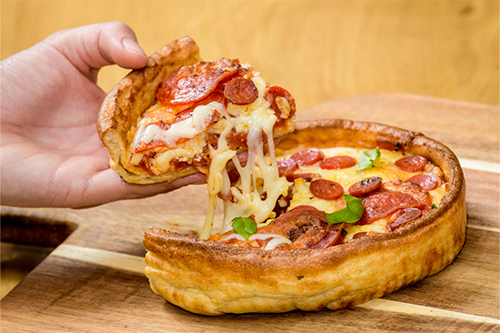 How about a Yorkshire pudding pizza, courtesy of Morrisons? On my same trip to Aberdeen I also encountered Cantails. Why add mixer to the spirit when you can do it the other way round?! Then garnish with some old school sweets. 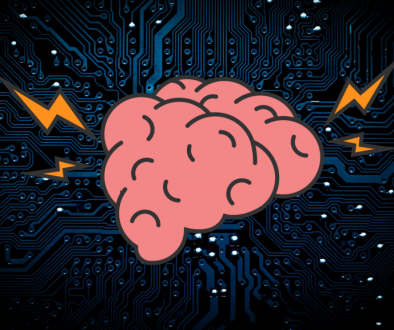 If you’re looking to try out some of your own weird and wonderful creations but not sure where to start, artificial intelligence can help you out. Chef Watson is an application of IBM’s AI supercomputer. It uses a large database of recipes to creates pairings and recipe ideas that can often defy existing convention. Chef Watson removes any human judgement so it is let off the metal reins to come up with all sorts of flavour pairings. Chef Watson is where I got the idea for chocolate mushroom truffles. I urge you to give it a go. People will want the recipe! The earthy flavour of the mushrooms gives a complimentary warm, savoury taste (which the Japanese term umami). Just make a chocolate ganache as you usually would with normal truffles. The difference here is you simmer a handful of dried porcini mushrooms in the cream first and leave it in order for the flavours to infuse. You can also blitz me extra fried mushrooms in a blender to make a porcini dust to sprinkle over your finished truffles. A sure-fire way to create something new and innovative is to combine existing ideas. When it comes to recipe ideas, the possibilities are infinite. You can experiment with cultural flavour fusions, make hybrids between classics or simply find a novel ingredient to throw into the mix. Fusion cooking often combines influences from Eastern and Western cuisines. Traditionally recipes and food cultures were local knowledge, based upon using locally sourced produce. These days there are no such barriers so there is now one giant melting pot of potential. I’ve even had Scottish tapas! Food mashups are also becoming more popular as chefs throw out the traditional rule books and allow themselves to get inventive. Here are a few bakery mashups presented as food equations. See if you can figure out the result of each mashup. It’s quite fun to have a go at creating your own food mashups. Just take two recipe books, pick a recipe from each at random and find ways of combining them. It doesn’t matter how similar or dissimilar they are. The goal is to find creative ways of combining their styles or ingredients. Idea 1: Replace the minced lamb in the Shepherd’s pie with minced prawns. It will be a bit like a giant deconstructed fishcake! Idea 2: Small cuts of lamb with a potato crust served in individual glass dishes on a bed of salad. Accompany with a creamy mint sauce instead of traditional Marie Rose cocktail sauce. Now if you’re thinking, what on Earth is lamb in a potato crust… here’s a recipe! P.S. 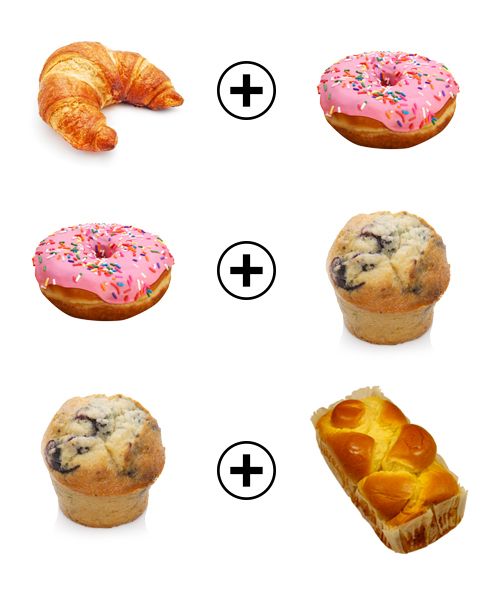 Here are the answers to the mashup equations: Cronuts (croissant and doughnut), Cruffins (croissant and muffin) and Bruffins (brioche and muffin). 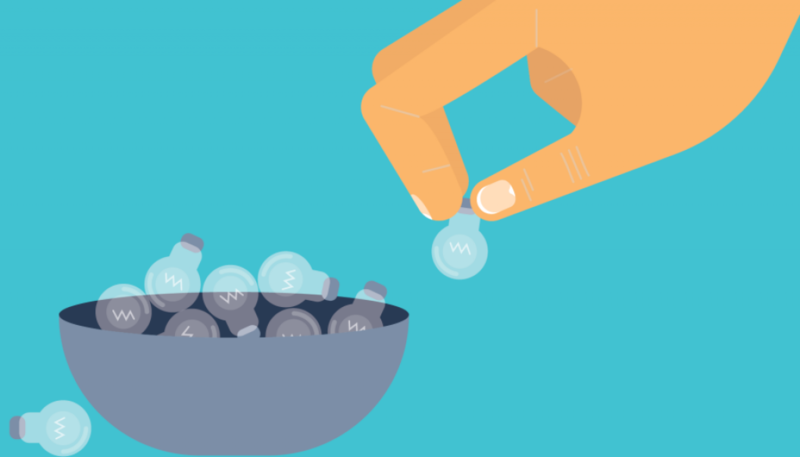 By creating purposeful constraints, you have no choice but to challenge your brain to start getting inventive. After all, necessity is the mother of invention. So here are a number of ways to give birth to new and inventive recipes. Do you think you could make chocolate mousse without eggs and cream? You can when you use avocado to replace them. You’d be pleasantly surprised by the result. Here’s a recipe to try it yourself from Gordon Ramsey no less. I always remember as kid making a flourless cake with ground almonds instead. It was deliciously squidgy. There’s now a trend to reduce or replace processed sugars in foods. Some opt for sweetness but it’s possible to replace sugar by using dried fruit such as dates to provide the natural sweetness instead. Can you make cookies without baking them. Yep! Here’s a recipe that involves heating the mix in a pan. How about steamed not fried doughnuts? Check these out. And if you’ve got time on your hands, you might think about slow cooking your pizza, brownies and cheesecake. Here are a number of unusual slow-cooked recipe ideas. Agar gels are a wonderful way of compacting flavours and adding a new texture to a dish. Perhaps having a go at making mango noodles to serve as an accompaniment to asian food. Powders are a great way to add instant colour and flavour to recipes. Here’s how to make your own. Did you know the pastry shell in cornish pasties was originally made not to be eaten but to hold the contents. I’m sure there are plenty of other ways pastry can be used to make messy foods portable. When I was growing up, the only thing my dad would cook were sausages, mashed potato, eggs and beans. But we’d have them presented in a number of different ways. 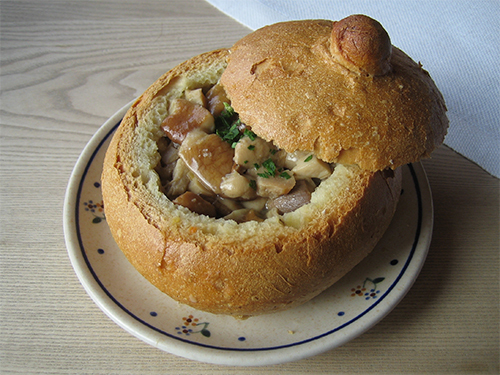 ‘Eggs in the nest’ involved beans in a ring of mashed potato and boiled eggs nesting on top. ‘Squashed hedgehog’ was a pile of mash with sausages sticking in it (like hedgehog spines) with beans surrounding it. My sister and I loved it! Always staying safe in the middle can get a bit boring. Going to the extremes can be exhilarating. Recipes provide us with a rulebook to ensure we don’t stray and make silly mistakes. Well silly doesn’t need to be a mistake. By really emphasising or exaggerating recipes, you can achieve some awesome results. Sometimes you just wish your food was bigger. 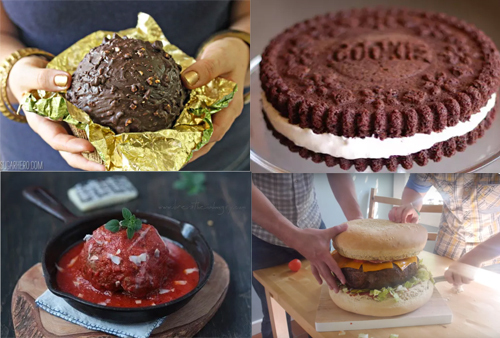 Well these should answer a few prayers for burger, meatball, Ferrero Rocher and Oreo lovers. Here’s a giant Oreo recipe to try. If your recipe calls for a certain ingredient or flavour, see what it happens when you take it to the max. Could your version be the spiciest, herbiest, chocolatiest or cheesiest ever?? I once heard a recipe for 40 clove chicken. Somehow my mind leapt to clove as in the spice, when in actuality the recipe was talking about garlic. So there I was studding away, in an attempt of making some kind of mulled chicken. It actually turned out to be really tasty! Now you are primed and ready to be a culinary creative. Whenever you say I can’t think what to cook for dinner, there are no excuses! Back to my kitchen to experiment with dinner. 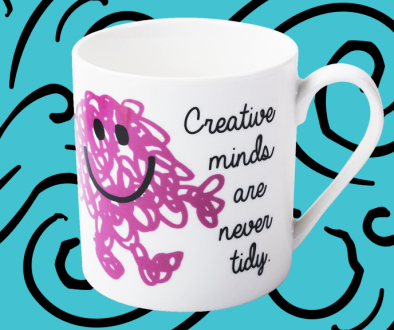 Be Messy – It’s Good for Your Creativity!